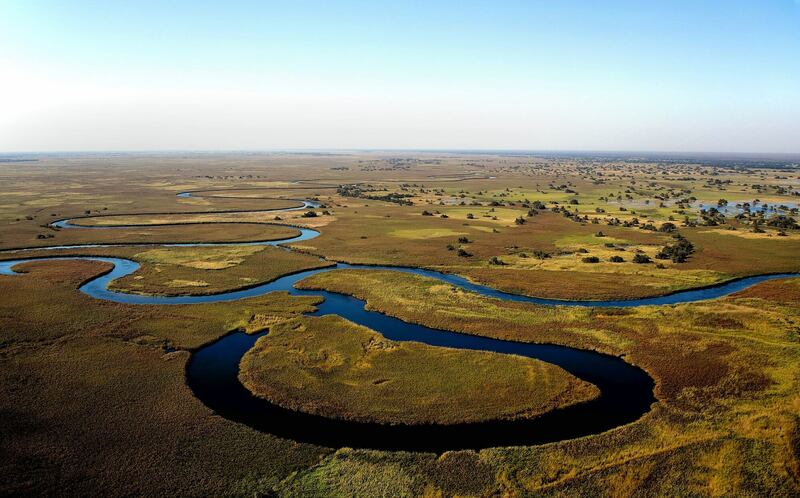 Aerial shot of the Okavango River, Shakawe, Botswana. The Okavango River (formerly spelled Okovango or Okovanggo) is a river in southwest Africa. It is the fourth-longest river system in southern Africa, running southeastward for 1,600 km (990 mi). It begins in Angola, where it is known by the Portuguese name Rio Cubango. Further south, it forms part of the border between Angola and Namibia, and then flows into Botswana, draining into the Moremi Game Reserve. Before it enters Botswana, the river drops 4 m in a series of rapids known as Popa Falls, visible when the river is low, as during the dry season. Discharging to an endorheic basin, the Okavango does not have an outlet to the sea. Instead, it empties into a swamp in the Kalahari Desert, known as the Okavango Delta or Okavango Alluvial Fan. In the rainy season, an outflow to the Boteti River in turn seasonally discharges to the Makgadikgadi Pans, which features an expansive area of rainy-season wetland where tens of thousands of flamingos congregate each summer. Part of the river's flow fills Lake Ngami. Noted for its wildlife, the Okavango area contains Botswana's Moremi Game Reserve.